Sliders are mostly used on the front page of your portfolio, business or personal web site. There are a lot of sliders available on the internet with each having its own unique feature. However, setting up, maintaining and editing a slider can be difficult for a non-technical person. In this article, we will show you, how to easily add a featured Image Slider in Blogger, which does not require frequent updating and it is updated automatically using Labels or when a new post is published. Image sliders of image carousels or slideshows is a nice way of displaying multiple images, content or videos on your website. Undoubtedly, images gives life to your content because it captures your visitor's attention immediately. Featured Image sliders are possibly the best way of showcasing one of your best recent content, articles, videos and etc. You don't have to update them on a frequent basis but you keep them with the best possible content available on your site. Before we start our tutorial, it would be nice for you to take a look at the demo of feature image slider demo here. 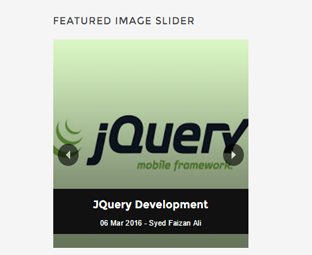 In this featured image slider, you do not have to update images or links manually. You do not have to edit codes or whatsoever because we have tried to keep simple and friendly for non-technical users. After doing the first step you have successfully installed the featured image slider in blogger. Now all you need to do is to display the slider at the place which suites you the most. Just paste the following code at the place where you want your slider to appear. listURL: Insert your blog URL here just like we have used mybloggerlab.com URL in the above script. listbyLabel: If you want to show images from a specific Label then change the above code to listbyLabel:"AmazingVideos". We hope this tutorial has helped you in learning how to easily add a featured image slider in Blogger. We will be bringing more great blogger widgets in feature to stay tuned and subscribe to Facebook, Twitter or Google+. Hello sir, please does this slider have an effect on the time load of my webpage? Because i read on a guide on blogging and online hustle that sliders delay load time and might reduce my earnings. I would love to know too. did it work for yoU? Please how will I show the image I like? Yes, It works fine please check the demo. but the images are so large and scary.